The Minister of State for Environment, Dr. Mary Kitutu, has raised concern over the unmet budget allocations, which have affected the ministry’s delivery of services. Appearing before Parliament’s Committee on Budget, Kitutu said that the Ministry had budgeted for shs3.7 billion in the current financial year to set up and conserve the Kalagala and Itanda Offset Sustainable management plan but had not received the money. She said that as part of an agreement with the World Bank to protect the environment surrounding the Isimba Dam, the Ministry of Water and Environment was supposed to set up a conservation system to protect the Kalagala Falls and Forest located in the upstream area of the dam. “We urgently need supplementary funding to meet the government’s commitment to protect the Kalagala falls because the World Bank expected us to have finished demarcating the area in June this year,” Kitutu added. She explained that the ministry had only managed to advertise for procurements for the projects, “but we have no money yet it was apportioned”. Kitutu added that much as the ministry budgeted for the money, it was never provided and they are operating in deficits. However, Hon. Anna Maria Nankabirwa (NRM, Kyankwanzi district) remarked that the request was not justified . “Do you, for example, need shs300 million to hold meetings and seminars as well as strategic sittings yet this ispart of your day-to-day work,” Nankabirwa inquired. Kitutu said the preparatory meetings were outside the ordinary working schedule and assignments as they involve field visits. The Deputy Chairperson of the Committee, Hon. 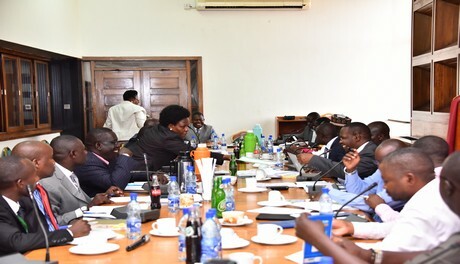 Patrick Isiagi together with the committee members endorsed the supplementary budget but urged the ministry to take note of urgent matters in time so that the Ministry of Finance is prompted to fund them early enough.